Happy Taco Tuesday everyone! And boy do I have a recipe for you. 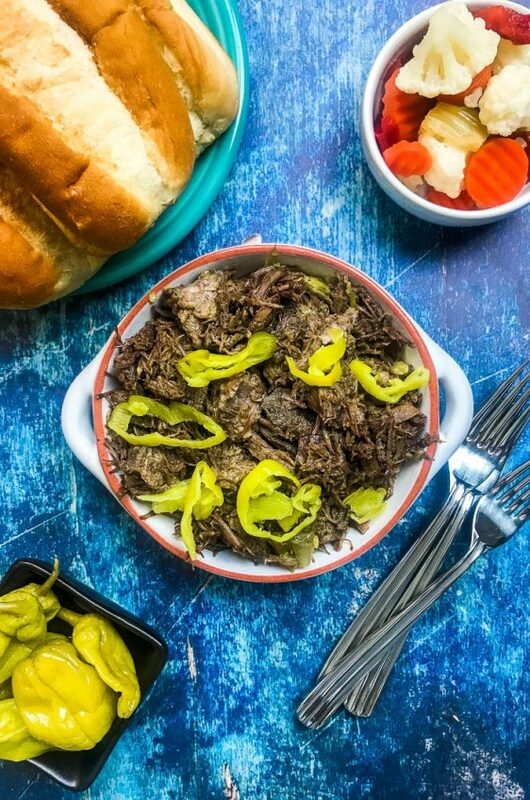 How do slow cooker carnitas tacos sound? 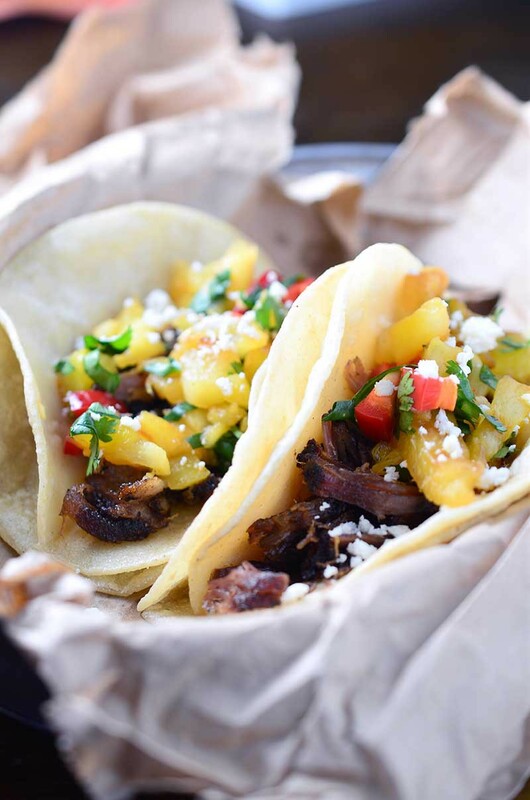 How about those same succulent slow cooker carnitas tacos topped with a spicy sweet grilled pineapple salsa? Yum right?! Well this recipe for Carnitas Tacos with Grilled Pineapple Salsa makes a big ol’ batch so invite your friends over and let’s have some tacos. A while back, I used to talk about how we would have sunday dinner with some friends of ours. Nothing huge. We would plan what we were going to make during the week, then they would come over, we’d visit, cook, drink some wine. It was one of our favorite things and was something that we looked forward to every week. Then, a little over a year ago, those friends of ours moved and sunday dinners came to an end. We still get to see our friends from time to time, but it’s not the same as our regular sunday dinners. So when Ryan told me last week that our friends were going to be in town and were coming over for dinner last Sunday I was super excited. It would be just like old times! I thought of making fried chicken because fried chicken just screams sunday dinner. Then I got to thinking, as much as I love me some fried chicken, it takes a lot of time. You spend a lot of time in the kitchen cooking it and the fact of the matter is I don’t get to see these people very often, so I’d much rather visit then spend time in the kitchen. And when I found out that it was going to be 70 degrees and sunny in April in Seattle, I just knew that a big ol batch of tacos was in order. Carnitas Tacos with Grilled Pineapple Salsa to be exact. 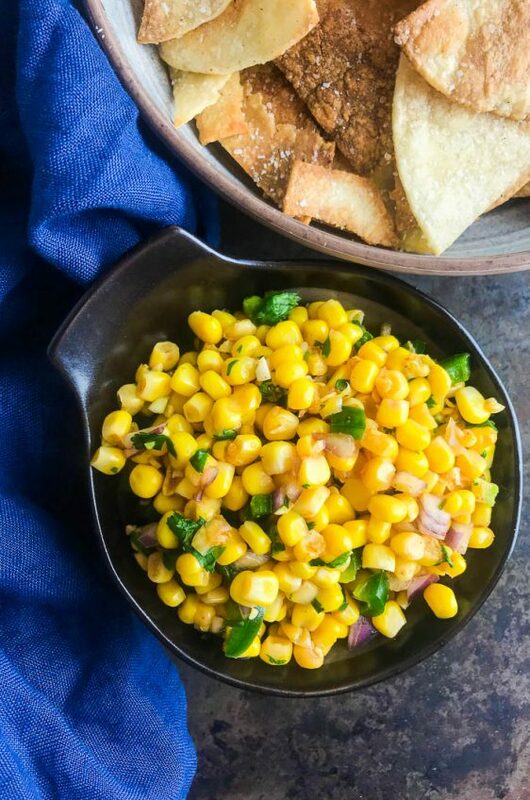 I don’t usually like pineapple with savory dishes, but this pineapple salsa has just enough sweet and just enough spice to make it the perfect addition to the savory tacos. I grilled the pineapple because I like the subtle charred flavor it adds and I used fresno peppers or red jalapeños to add a touch more color. If you can’t find them then regular jalapeños will do just fine. As far as kitchen time goes, this recipe does take a bit of planning but over all your amount of time in the kitchen is minimal. 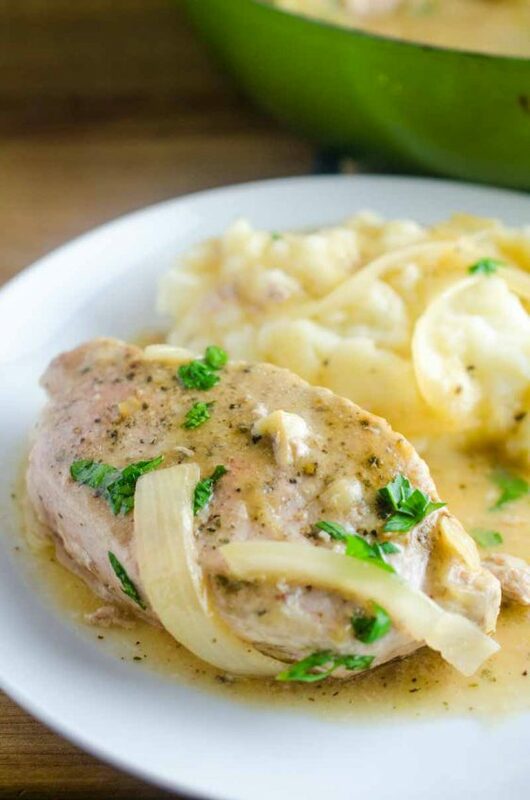 You get the pork seasoned the night before, put it in the slow cooker in the morning and let it simmer away most of the day. 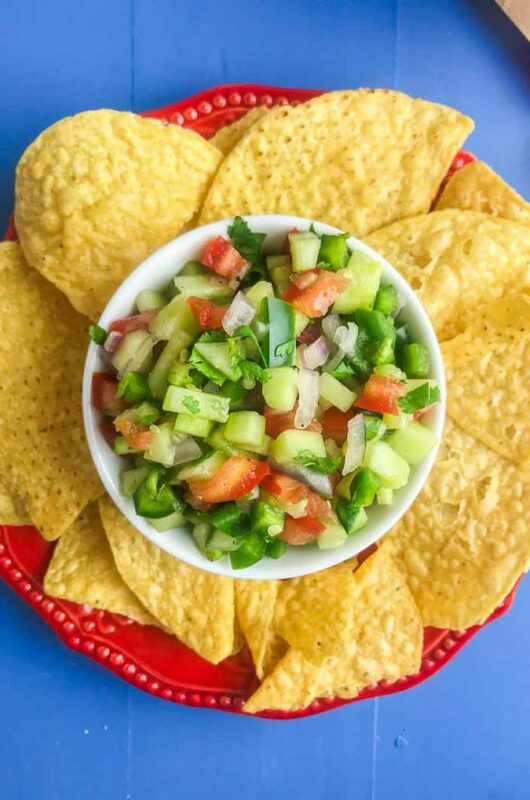 Then about an hour or so before you are ready to eat, grill your pineapple for the pineapple salsa, mix and let it sit for a little while, about 30 minutes or so, so that the flavors have a chance to meld. While the pineapple is busy making flavor babies with the jalapeños, shred the pork. But shred it in the slow cooker and let it sit on the warm setting while you fry your taco shells. That way, while you’re frying away, the pork is busy soaking up all of those wonderful juices in the slow cooker. 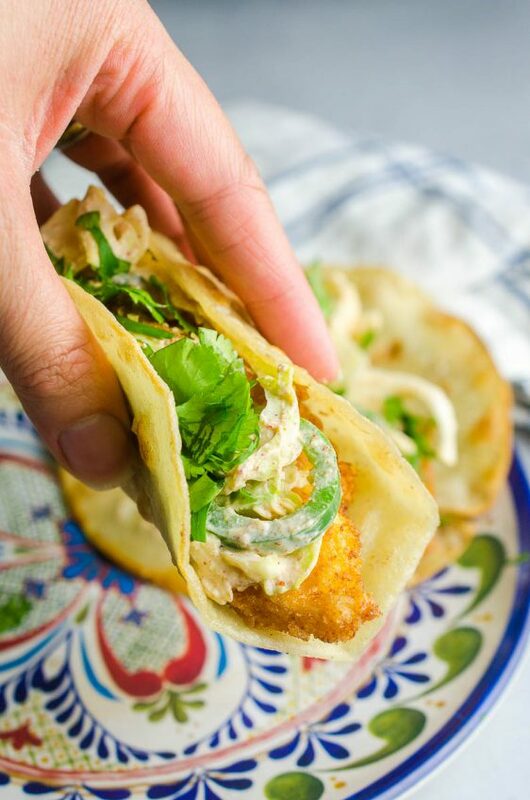 Finally, fry your taco shells and you’re ready to go. Combine the oregano, salt, paprika, garlic powder and chipolte powder together in a bowl. Rub spices all over pork. Wrap pork in plastic wrap and refrigerate for 8 hours or overnight. The next day, remove plastic wrap, place pork in the slow cooker and cook on low for 8 hours. Turn grill to medium heat. Place pineapple on grill and cook 2 - 3 minutes per side or until dark char marks appear. Remove from grill and allow to cool. Once cool dice. Combine pineapple, cilantro, peppers, lime juice and lime zest together in a bowl. Cover and refrigerate for at least 30 minutes. With pork still in slow cooker, use forks to shred. Cover and turn to warm setting while you fry the taco shells. Heat a thin layer of oil in a skillet over medium-high heat. Fry one tortilla, 15 - 30 seconds on each side. Transfer to a paper towel lined plate. Repeat with remaining shells. To make a taco, spoon shredded carnitas into a taco shell, top with a spoonful of salsa and sprinkle with crumbled cotija cheese. Serve. YUM! I absolutely love grilled fruit – especially pineapple..great recipe! How have I missed taco tuesdays?! Carnitas tacos are one of my absolute favorites! 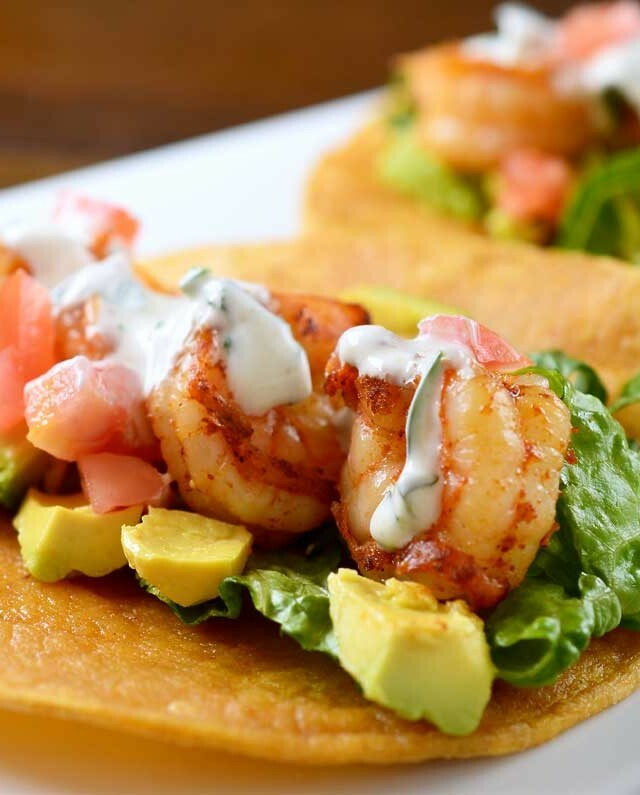 I am SO glad it is taco Tuesday, because these look delicious! – and I’m not crazy for sweet either – unless there is some spice to go with it! This looks fantastic!I love the grilled pineapple salsa to add! Takes the meal one step further! Cheers! Des! You made one of my most favorite things to eat, street tacos with fruit salsa. Pinned this! I must make it soon.